Tour de Fleece, the grand summer spin-along to the Tour de France, is coming up on July 4th. I am so excited to spin more yarn for my fourth Tour! Part of the why I look forward to it every year is that I add lots of new handspun to my stash. I haven’t knit it all up yet but that’s okay. The reason I’m most excited for Tour de Fleece though is that I use it as a time to learn new techniques, try different fibers, and level up my skills. Before the 2014 Tour I wrote a post with 5 training tips for Tour de Fleece. This year I’m taking my own training advice which means the first thing to do is empty all my bobbins. I only have 3 bobbins that I can use on my Sidekick and one of them is a Jumbo for plying. My current project, 4 oz of hand dyed falkland, has been on the wheel for far too long and I finally finished spinning the second single last Monday. Tuesday, I started plying. I’m still plying today, but I’m always happy to see how much faster the bobbin fills up. One more skein before Tour de Fleece! Well, at least one more. I’ve also set my goals for 3 weeks of dedicated spinning. The first and most important one, don’t hurt myself. My shoulder wasn’t pleased after I spent so much time drafting long-draw last year. I had no choice but to take a spinning break. My second goal involves this yarn I’m spinning right now. Before I started drafting I watched the second segment of Jacey Boggs’ Craftsy class, Drafting From Worsted to Woolen. The difference in my worsted spun yarn before and after watching the 23 minutes of this segment is incredible. My singles are smoother, more consistent, and much finer. So, for Tour de Fleece I’m going to spin and ply my way through the rest of Drafting From Worsted to Woolen. This is going to be fun. Happy spinning and training for Tour de Fleece! I can’t remember exactly when I first started following CosyMakes but I’m fairly certain I was still in college. 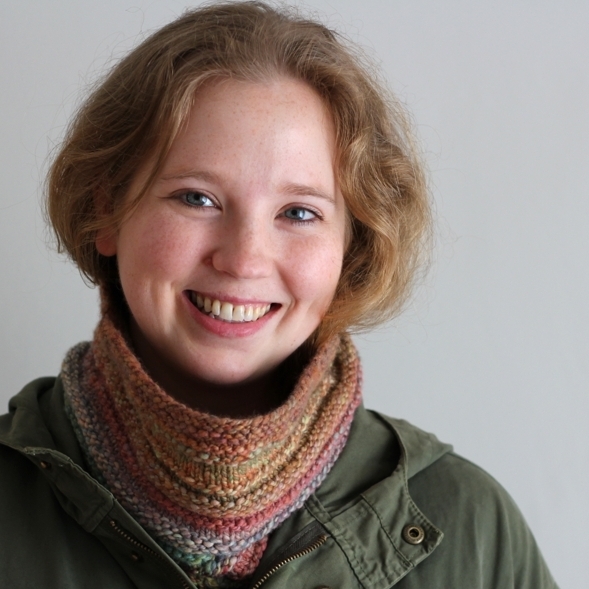 I liked her blog, her patterns, and her hand dyed yarn and fiber. Still do. I wanted to join her fiber even though I didn’t know how to spin. So, during a February Sale, I snapped up a few bumps of fiber. The Falkland was every bit as pretty in my hands as it was on the computer screen. Soft too. The first word that popped into my head when I unchained the top was, Fractal. The small color palate was clear and distinct with an obvious repeat. A perfect dye job for fractal yarn. I didn’t hesitate to split the fiber lengthwise and then split one half three more times. It’d be so easy to divide the stripes further but I like to keep the repeats longer rather than shorter. Spinning the singles long-draw was easy but it took me awhile to ply them together. When it came time to soak the yarn, I had to wash the dishes to clear the sink. Annoying but handspun is worth a little scrubbing. I’m not sure what the yarn’s next step is. Maybe a shawl or a cowl or simply a gift. I can think of a few people who would gladly take this yarn off my hands. Wednesday night, I heard rumors of approaching snow and was quite skeptical. I’ve heard these tales before but this one actually turned out to be true. When I looked out the window Thursday morning, snow was falling at a lovely diagonal. The flakes were so heavy that they didn’t land. They plopped. Dry snow this was not. Still, it’s snow and I took the opportunity to get some photos of knitwear in it’s natural environment. This is another pattern that’s been sitting in the queue for ages. I finally decided to cast on for them the last time it got cold and didn’t have anything wooly or long enough to cover my fingers. Putting these mitts on instantaneously warms my hands. I’d like to think that it’s because I’m using my own wonderful 3-ply handspun (it debuted as the sea a few months back) but it’s probably just the thicker than normal layer of wool. Either way, still great. The mitts are also extra special because this is the first time I’ve really knit with my own handspun. To be honest, I wasn’t sure what to expect. I worried about the gauge. I worried about the stitches being too open where the yarn was thin. I worried about the stitches being too bulky and bulging where the yarn was thick. I worried about running out of yarn since this was the only skein I had. Eventually, I just put those anxieties on the shelf and knit a swatch. I picked the needle size that gave me a nice fabric and got to work. I kept an eye out for problems and tried on the mitts frequently. Know what I found? Perfectly good yarn that knit up evenly and at a consistent gauge. There were no open spots or bulging stitches. There were no breaks. There was just a good, solid yarn that I would love to knit with again. 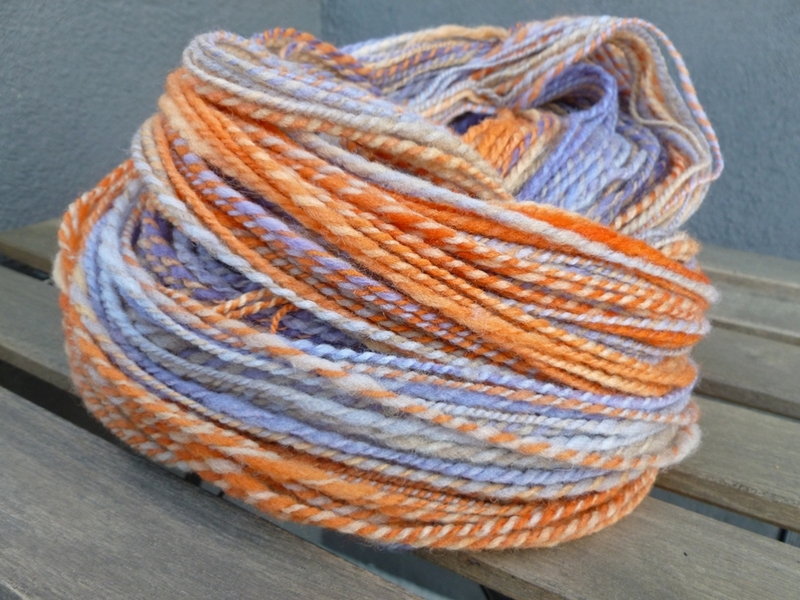 Handspun, I’m officially and unapologetically in love. Back to the mitts. The fact that I could knit them long enough to cover my fingers and fold back the extra fabric when it wasn’t needed is what made me queue these mitts to begin with. Cute buttons don’t hurt either. To get the best coverage and the most out of the yarn, I knit the mitts from the fingers down and completely reversed the pattern. Used the same numbers though. 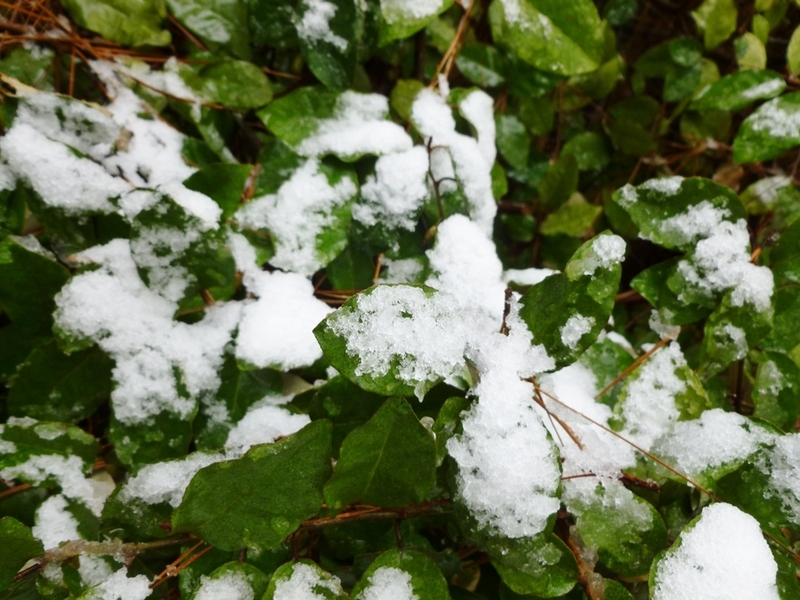 While I was photographing the mitts, the snow was already starting to melt and turn to slush. See you next time, snow. I’ll be waiting with handspun mitts. You can blame this one on a freezing, early morning. A few weeks ago, I was working an early shift that had me out of bed at 4:45 AM and out the door an hour later. I had a hat, a heavy coat, and a pair of fingerless gloves. These things were not enough protection from the 19º temperatures. After a 5 minute drive to work, an altercation with a security guard that I’m not going to go into, and walking into the building, I was freezing. My hands were so cold that it felt like my fingers were burning off. It was at that moment that I decided to make that pair of convertible mitts. This particular pair had only been in my queue since before Ravelry. Obviously, this is a hat and not a pair of mitts. This is also a hat that matches those mitts. The hat came first since I knew how much yarn it would use and it would make a good swatch. Plus, two layers of wool is warmer than one. It’s oversized, slouchy, soft, and I love wearing it even on days when it’s not 19º outside. The Bearded One thinks it’s one of the coolest hats I’ve ever made and he’s not the only one complementing. I’m kicking myself for not starting this (and the mitts) sooner. When I finished the hat, there was more than enough yarn left for a pair of mitts. I’ve almost finished the first one too. It might be not be cold enough again to wear them this winter but I’ll be ready for next time. My boss. He's a demanding taskmaster. Usually, I don’t put much stock in New Year’s Resolutions but the start of a new decade seems too powerful not to take advantage of. I have my small list of resolutions but, before I can get started, there’s some unfinished business from 2009 to put to bed. I thought the Snow Cat Hat was really cute when I first saw it and I was thrilled when I won the pattern. After some obligatory yarn shopping and during a break from Christmas knitting, I quickly cast on. The hat was a fun, quick knit that I finished just in time to wear for Halloween. The only change was an additional .5” to get one more full repeat of the lace pattern. Since there was half a skein leftover, I decided to make a pair of matching fingerless mitts. The base pattern is my own with the lace and a similar rib pattern added in. I had just enough yarn to make them too but I was a bit worried over the last few rows. These hat and mitts have become my go-to set ever since, not only do they match my coat, they also keep me warm near drafty windows. You can’t beat that.